Why I’m allergic to milk. Almost seventeen years ago, I was attending Annsworth Montesorri Academy in Largo, Florida. My teacher was a sweet elderly lady, Mrs. Lebo, who had curly gray hair and smelled like fig newtons. My principal was Mrs. Johnson, a short sprightly woman with lightning gold hair and eyes smaller than mine. Every morning, I bowed to both of them and they cheered me on with exaggerated delight, smiling wonderfully approving smiles. That particular day was gloomy and chilly, the clouds swirling in weepy brush strokes. It was like God had painted the sky and forgot to finish. I was excited because it was the first time I was aware my birthday had any real significance, and besides the perks of presents and singing, I was one more year on my way to becoming a grown-up. 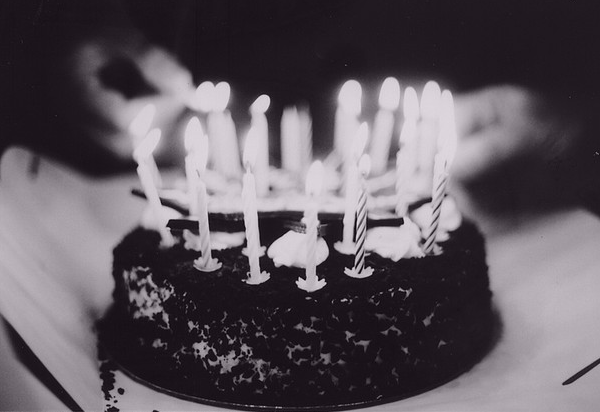 There were at least five or six birthdays that had already been celebrated in my third grade classroom and each one was almost identical: a cake, candles, cards, and hats. The lights would go out and everyone would sing as the teacher or other qualified faculty member brought the cake in the room, alive with eight fiery candles. I was allergic to cake so I was never able to have a piece. I dreaded the day my birthday would come because I knew we couldn’t have cake. When that day came, I walked into class and told the teacher I had an announcement. Mrs. Lebo obliged and I took the front of the room. Hi everyone. You all know that I’m allergic to dairy products and I can’t eat milk or cheese. Cake also has milk and/or cheese. So we can’t have cake today. I’m sorry. Everyone looked disappointed. A few snorted. Mrs. Lebo shushed everyone and we commenced class. The day progressed and I looked outside at the streak of clouds, wondering why God the sky-painter had given me these stupid allergies. I imagined a lunch tray with eight candles burning on their sides – no cake whatsoever – as the room sang a hollow rendition of what should’ve been the best song ever (except Jingle Bells, Batman smells, Robin laid an egg), and I lost myself in my head again. At the end of the day we gathered close for the birthday celebration. My stomach was in knots. My fellow classmates, with unforgettable names like Ben Hedstrom, Kim Ormand, Erin Heaberlin, Ryan Dixon, and Christopher Douglas, looked rather cranky to have a birthday with no pastry. Suddenly my mom burst in the room. She was holding a huge plate of Korean mandu. Someone beside her was holding a huge plate of strawberries. And someone else was even holding a cake with candles in it. The room woke up and everyone sang in a quick fervor. I clapped like a mad idiot and blew out the candles in only eight or nine tries. Mrs. Lebo cut the cake but the classmates were more interested in this mandu stuff. Okay everyone, this is called mandu. It’s like a big rice skin with meat inside. You dip it in the soy sauce and eat it, but be careful! It’s hot and it can turn off your tongue. Each student tried them. My mom had made at least one-hundred mandu and she sat patiently in the corner, watching our reactions. The first few classmates bit into them, then nodded their heads in unison. A few more tried and eventually the whole class was in an uproar, grabbing three or four mandu at a time. No one even touched the cake. In less than five minutes all the mandu was gone. In another three minutes all the strawberries were gone. And for the next two years my mom made mandu for the class on my birthday. Every year after, my mom had become too busy, but it was a long time before my friends stopped asking when the mandu would come back. This is why I’m allergic to milk. No one questioned the mandu, no one thought it was gross, no one made fun of it or refused to eat it. We simply ate it together, a bunch of bright-eyed, hungry, naïve, restless kids that knew nothing about birthdays and only knew about cake. Or in my case, rice skins full of meat. That was the best birthday I ever had. Thank you mom, for making it the best.